Oil and gas are essential utilities that help keep our modern world moving and the oil and gas industries are important parts of our nation’s economy. However, as the residents of San Bruno know far too well, oil and gas lines can be incredibly dangerous. At the Brod Law Firm, our Northern California pipeline accident lawyer believes that safety must be priority number one and our team is ready to step forward to help anyone injured in a pipeline accident. 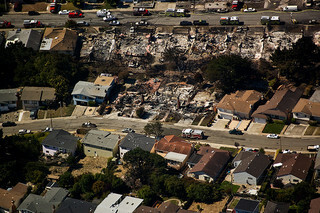 Last fall, ABC7 marked a somber anniversary, calling September 9, 2010 “the day no one can forget.” On that date, a PG&E natural gas pipeline exploded in San Bruno sparking a huge fire that one resident compared to “a geyser of flames.” The blaze ultimately claimed eight lives and left 66 people injured. Thirty-eight homes were destroyed and more than a dozen lots remained vacant as of the four-year anniversary. Not surprisingly, residents remain angry with PG&E despite the $1.4 billion fine levied against the industry giant, noting that the incident could have been prevented and saying the company has not properly apologized to those impacted by the tragedy. This week, The Oakland Tribune followed up on the safety recommendations issued in the wake of the San Bruno pipeline explosion. An independent audit by Crowe Horwath identified 12 major issues that the Public Utilities Commission (“PUC” or “the Commission”) must address to provide a safer environment for all Californians. The audit follows a finding that PUC’s lax safety procedures played a major role in the 2010 disaster. Among the most important problems identified in the audit are poor record-keeping, outdated technology, delayed inspections/incident reports, poor communications, a failure to analyze risks, and a lack of accountability and standards. Overall, reviews of changes made by the Commission in the past five years are mixed. Mark Toney of The Utility Reform Network suggests the PUC is headed in the wrong direction. Others note a change in tone under the Commission’s new leadership with Michael Picker at the helm. Picker helped craft the punishment levied against PG&E by the PUC. He takes over following the departure of agency president Michael Peevey who left amid allegations he fostered an atmosphere of lax oversight and too-close ties between the Commission and the large utility companies. If there’s one central theme running through our blog entries it is the importance of prevention. Whether the topic is car accidents, elder abuse, or pipeline explosions, we believe prevention should always be the goal. Civil litigation helps right wrongs, it can’t turn back time but it can help victims move forward. We hope the PUC and PG&E take this opportunity to re-prioritize and focus on safety. We hope no other community has to go through the terrible experiences that San Bruno has faced. However, if an oil or gas explosion has impacted you and/or your family, our San Francisco pipeline explosion law firm is here to help. We will work to get justice for you, recognizing that paying damages forces companies to recognize that lax attitudes towards safety will not be tolerated.